The Datastore step of the wizard is available if you have chosen to change the location and settings for the restored VM. You can place an entire VM to a particular datastore or choose to store configuration files and disk files of the restored VM in different locations. Select a VM in the list and click Datastore. To apply changes in bulk, select several VMs in the list and click Datastore. Point to a datastore where VM files must be stored. Expand the VM in the list. Select the necessary file type and click Datastore. Select a datastore where the selected objects must be stored. To facilitate selection, you can use the search field at the bottom of the Select Datastore window: enter a datastore name or a part of it in the search field and click the Start search button on the right or press [ENTER]. By default, Veeam Backup & Replication preserves the format of restored VM disks. If disks of the original VM are provisioned as thick, Veeam Backup & Replication will restore the VM from the backup with thick disks. 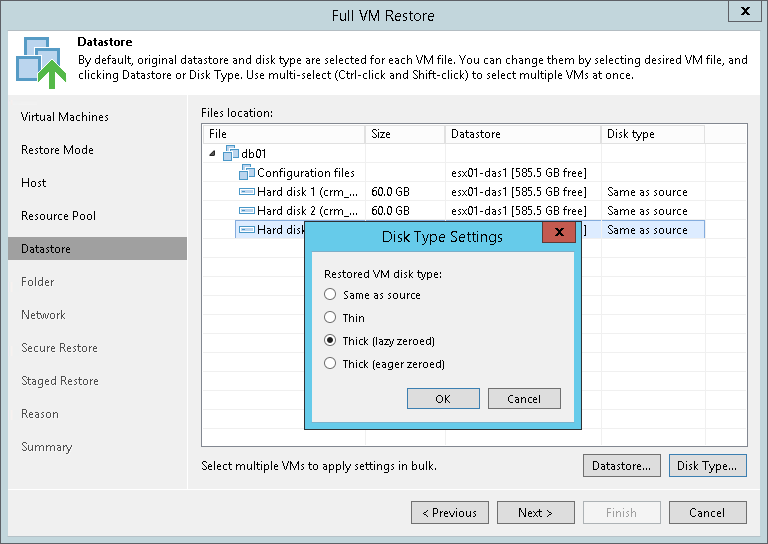 If necessary, you can change the disk format of a restored VM. Expand a VM in the list. Select the disk and click Disk Type. In the Disk Type Settings section, choose the format that will be used to restore virtual disks of the VM: same as source, thin, thick lazy zeroed or thick eager zeroed. For more information about disk types, see https://pubs.vmware.com/vsphere-60/topic/com.vmware.vsphere.html.hostclient.doc/GUID-4C0F4D73-82F2-4B81-8AA7-1DD752A8A5AC.html. Disk format change is supported only for VMs with Virtual Hardware version 7 or later.